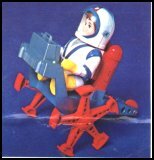 "America's first boy in space!" by a gear in their bottom and a battery pack on their back. in and power a television set, ray gun and underwater light. Common accessories with these sets were red space sleds, yellow walkie-talkies and TV cameras. The Action Sets also came with a small comic that showed one of Billy's adventures and, of course, promoted other Billy Blastoff products, similar to the comics that came with Hasbro's GI Joe Adventure Team sets and the Marx Lone Ranger adventure disguises. There are some very rare carded accessory sets that compliment the Action Sets like the Scuba Scout pack which includes a camera, sea tow, mask and speargun or the Construction pack which contained a drill, spade and pebbles. Billy is hard to find today without cracks and in working condition. His friend Robbie is commonly missing his antenna. The Fireman and the Pilot are harder to find than the other figures. A good loose figure might set you back as much as $75 and complete playsets between $150 and $300. The Accessory Packs can bring up to $75.